Perhaps because of my background in microbiology (with a PhD in Microbiology, Immunology and Infectious Disease) I am very particular about how to address bacteria in the body. I have very definite ideas about approaching non ideal microbes, as well as very specific reasons for my rationale in balancing normal flora in the body. As part of my gut protocol I only suggest the use of two types of bacteria as probiotics for my program, focusing on the use of a range of sources and strains of Lactobacillus and Bifidobacterium. Lactobacilli ferment sugars to lactic acid, which provides an acid environment in the large bowel to protect against infection. The use of a B complex, such as Ultimate B allows the lactic acid produced to feed directly into the Krebs/Citric Acid energy cycle of mitochondria. Bifidobacteria aid in digestion and protect against the development of allergies and some cancers. If the level of Bifidobacter declines in the intestines it allows for the growth of other non-ideal organisms. In particular, some strains of Bifidobacterium and Lactobacillus help to limit the growth of H.pylori, which can be a major issue for those with autism and as well as up to 1/3 of the adult population. Lactobacillus reuteri and Lactobacillus rhamnosis have been reported to help lower the level of H.pylori as well as limiting the growth of other non-ideal organisms in the gut. Recent studies indicate that L.reuteri may limit certain autistic characteristics in animal models of autism. In addition, Lactobacillus reuteri has also been reported to be particularly useful for female health, limiting non-ideal microbes and aiding in healthy vaginal flora. I also choose to use low doses of the yeast Saccharomyces as a probiotic to limit the growth of non-ideal yeast such as Candida. I only use these two types of normal flora, Lactobacillus and Bifidobacterium(along with one strain of normal yeast flora) based on the positives of their use and the potential negatives of some of the other types of bacteria that are often considered ‘normal flora’. While other species, such as certain strains of Streptococcus or Streptomyces or Bacillus are often included in probiotic mixtures, I have found over the years, that at least in the populations that I work with, that these other strains are not ideal for support. The populations using my program tend to have significant gut issues, often have imbalances in their immune responses and a large proportion are positive for H.pylori, Mycoplasma and other non-ideal microbes. It has been my experience after looking at literally thousands of gut tests over more than a decade, that there is a tendency for the levels of Streptococcus, Streptomyces and Bacillus to overgrow the rest of the normal flora. This reaches a point where these organisms can show up at a 3 or 4+ level on a CSA test, yet at the same time there is little to no detectable Lactobacillus or Bifidobacter. 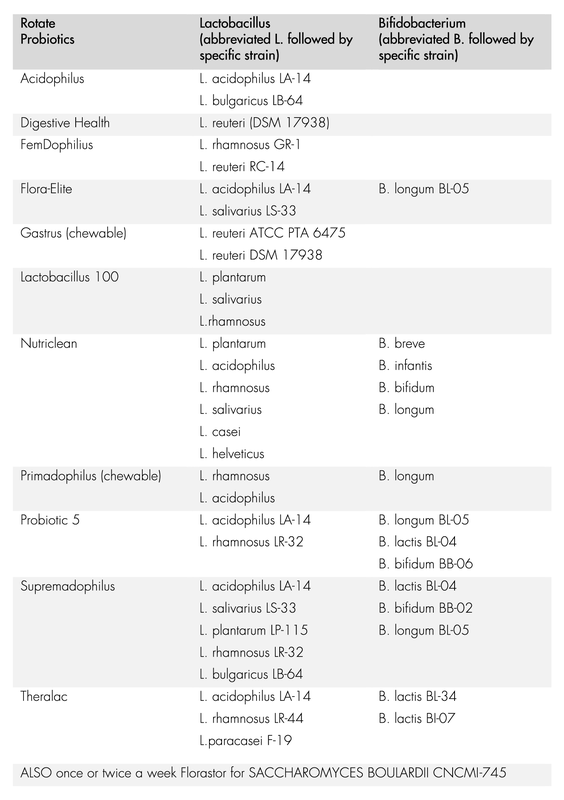 Where Lactobacillus and Bifidobacter are desired normal flora in the system (for the reasons outlined above), it has been my finding that limiting the normal flora to just these two strains, helps to promote their growth and limits the overgrowth of other strains that are often included in mixtures of normal flora. For this reason, I strongly believe in working with probiotic sources that are limited to Lactobacillus and Bifidobacter, with low doses of Saccharomyces. The second aspect to consider, aside from focusing on these two strains of normal flora, is to concentrate on rotating your sources of these probiotic strains. There are several reasons why it is important to rotate probiotics, based in part on my years of research using bacterial strains and studying antibiotic resistance. First, it is a good idea for your body not to become too accustomed to any one probiotic, to essentially keep your gut guessing by using a variety of probiotics and strains. Next, by constantly introducing different strains of probiotics you expose the immune system of the gut to different probiotics. In addition, the various strains (of Lactobacillus and Bifidobacterium) have unique characteristics, by using a range of probiotics you have a greater chance of gaining the benefit of a variety of positive traits. In order to have a competitive edge over other normal flora, bacteria contain something called ‘bacteriophages” known as phages for short. These are viruses that that bacteria use to gain advantages over other bacteria. Probiotic strains of bacteria can use phages to infect other probiotic bacteria and limit their growth. Research studies illustrate that that normal flora use the “kill-the-winner” dynamics, which suggests that phages are preferentially directed against bacteria that are present at high numbers in that environment. Thus, based on the “kill-the winner” concept, probiotic populations may become the subject of phage predation and in fact, any strain that increases its numbers relative to that of other bacteria occupying the same ecological niche will quickly be eliminated by phage predation. What this means is, by rotating probiotics, from a range of sources and using a range of strains you increase the chances of maintaining a positive balance of normal flora in the gut. Contains a blend of two strains of Lactobacillus: L. acidophilus La-14 and L. bulgaricus Lb-64. Contains a strain of Lactobacillus reuteri, Lactobacillus reuteri Protectis DSM 17938. Research indicates that Lactobacillus reuteri is able to prevent the growth of H.pylori (the bacteria that causes stomach ulcers). This strain of L.reuteri also has been shown to reduce colic in infants. Recent studies indicate that L.reuteri may limit certain autistic characteristics in animal models of autism. In spite of the name, I find this to be an excellent supplement for males as well as females. Particularly in cases where I am having trouble increasing the levels of normal flora on a CSA test, the use of Femdophilus daily, while rotating the other sources of probiotic has been able to restore Lactobacillus to healthy levels. This normal bacterial flora capsule is a source of two strains that may also be particularly helpful for female vaginal balance as well as microbial balance to limit H.pylori. 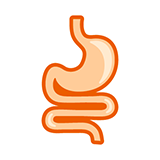 Lactobacillus reuteri and Lactobacillus rhamnosis have been reported to help lower the level of H.pylori as well as other non-ideal organisms in the gut. A recent study also demonstrated the reversal of certain autistic behaviors in animal models when supplemented with Lactobacillus reuteri. This probiotic is a different source of Lactobacillus acidophilus as well as a source of Lactobacillus salivarius and Bifidobacterium bificum. A source of Saccharomyces boulardii lyo, which is normal yeast flora which can help to limit the growth of Candida. I only like to use this capsule once or twice a week to support the presence of Saccharomyces but only at a low level in the system. This is a source of two different strains of L.reuteri. A recent study demonstrated the reversal of certain autistic behaviors in animal models when supplemented with Lactobacillus reuteri. In addition L.reuteri can help limit the growth of H.pylori. Yet another source of Lactobacillus to offer a range of sources and strains of Lactobacillus. This mixture includes L.plantarum and L.rhamnosus both of which are reported to aid in addressing H.pylori. In addition, it is another source of L.salivarius. Another source to rotate that includes both Lactobacillus as well as Bifidobacter. Theralac includes some unique strains of both Lactobacillus and Bifidobacter. For this reason, I really like this probiotic as part of the overall probiotic rotation. 1. After running a CSA, look at the herbs listed as showing bacteria or yeast sensitivity. Those herbs would be a starting point for support. 2. In addition, I ALWAYS like to use a range of other herbs reported to act on microbes to prevent microbial resistance from cropping up. Similar to the approach used for probiotics, the idea is to use a range of additional herbs with different purported modes of action. In my personal opinion and experience I have found that adding a number of herbal combinations in addition to particular herbs that are listed as sensitive, renders the bacteria more vulnerable. 3. In my opinion, I suggest you consider Naturomycin and Seasonal Support and GSE along with particular herbs that indicate good results on the sensitivity chart (at the end of the CSA test. Depending on tolerance and finances these other more general supports can be used one to three times daily to address the microbes from multiple vantage points. 4. If biofilms or chronic infections are a concern, then as tolerated also consider Bactisolve to help weaken the protective layers surrounding the bacteria (as long as there is no shellfish allergy). 5. As always defer to your own doctor especially when dealing with bacterial issues. The exact ingredients for all of these suggestions are clearly listed so that you and your own doctor can consider equivalent substitutes as desired.